A YouTube video is worth more than a thousand words. The website of the National Association of Theatre Owners, the other NATO, greets its visitors with an animated feature of theater food singing “Let’s all go to the lobby to get ourselves a treat.” (Watch it below.) 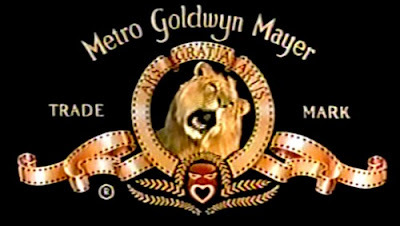 No MGM lion or flashy presentation of digital theaters, no: animated pop-corn bags and cups of soda practically begging you to buy food when you go to the movies. This funny detail is telling of how hard it is for theaters to turn a decent profit from ticket sales alone. With admissions at $10 and an endless series of blockbusters, what gives? At the risk of spoiling this movie, the answer lies in the distribution of power between distributors and exhibitors. 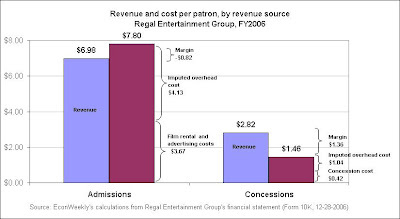 Let's have a look at the revenues and costs per patron of Regal Entertainment, the largest movie exhibitor in the US. (Data from the company's financial statements.) The average price of a ticket in 2006 was $6.98, $3.67 of which went to pay for the film’s rental and advertising, leaving the theater with $3.31 ($6.98 - $3.67) in gross operating margin. Food and beverage sales, on the other hand, brought $2.82 per patron, but cost Regal just $0.42, resulting in a gross operating margin of $2.40 per head from concession sales. Given that the exhibitors’ profitability depends so critically on popcorn and Milk Duds, I wonder why they don’t market concession treats more aggressively. In most theaters patrons have access to the concession stand only after they have purchased and validated their movie ticket. Theaters could increase revenues by setting up sale points in front of the box office, not behind. In addition to feeding people who are standing in line to buy a ticket, those stands could generate sales from passers-by who have no intention to see a movie – I find it a bit odd, but many people seem to enjoy extra buttery popcorn and movie nachos even when they’re not distracted by a screen. I also wonder why, in general, theaters don’t sell movie merchandise – caps, T-shirts, Spiderman masks, golf balls with Gollum’s face on them, what have you. The breakdown of profits I showed above does not imply that selling movie tickets is a ruinous business. Remember: the unit profit from tickets is negative only after including overhead costs. Because those costs are largely invariant to the number of patrons, higher attendance would increase the average unit profit from admissions Cheaper tickets would raise patronage -- and the highly profitable concession sales that come with it. Unfortunately (for theaters) distributors have the upper hand. 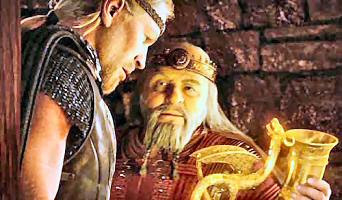 Seven companies controlled the release of the top 20 films in 2007, which made up 44 percent of annual box office revenue as of December 15. The exhibition industry is on the opposite end of the concentration spectrum: the largest theater operator owns just nine percent of all sites; the second largest exhibitor owns about five percent. Theaters are in no position to choose who they rent films from. Adding to their bargaining power, distributors derive an increasing share of their revenues from the rental and sale of DVDs. In a not too distant future, distribution could bypass theaters entirely. A recent paper in the Journal of Marketing estimated that film studios could increase revenues by 16 percent if films were simultaneously released in theater, on rental DVD and video-on-demand, with a three-month window to DVD retail. On the flip side, theater revenues would drop by 40 percent: a death sentence. Another manifestation of the power of distributors is the terms of exhibition contracts. Most agreements between exhibitors and distributors call for a sliding percentage of box office revenues. For example, a contract may specify a 90:10 split during the first week (10 percent for the exhibitor), 80:20 the second week, 70:30 the third week, and so on. In case a film does not perform up to expectations, the distributor also has the right to a certain minimum payment. That the distributor shares an increasing share of the revenue goes against the exhibitor, because demand for a film falls sharply over the weeks. Last, but not least relevant, distributors control the timing of releases. Because the distributor earns most of its revenue over the first two or three weeks of the movie’s screen life, openings are tightly spaced -- at any rate, too tightly spaced from the theater’s point of view. 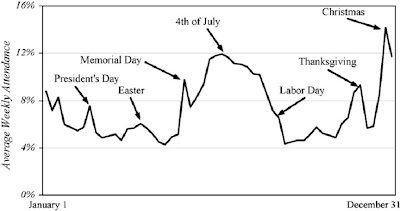 The glut is apparent over the summer and on holiday weeks, when underlying demand is strongest (see Chart 2, from Orbach and Einav, 2007). And the trend seems to become stronger over time: 33 films are opening this December, compared with 21 over the same period in 1999 (data for 1999 come from Einav’s Stata data file). The obvious solution to the conflict of interest between exhibitors and distributors is vertical integration. But a 1948 decision by the Supreme Court forbids it. The ruling followed an antitrust lawsuit between the federal government and the big studios. One of the objectives of the court was to allow exhibitors to select which movies they would show. In retrospect, and putting it kindly, the ruling fell short of meeting its goal. An alternative strategy would be to join forces. An exhibitor with significant market share at the national level would have bargaining power against distributors. From a regulatory standpoint, a merger between theaters can pass an anti-trust test. Courts are usually concerned about the effect of industry concentration on the price, quality and selection of the final product. But a merger between theater chains need not raise such concerns if the merged company divests from local markets where it otherwise would have a monopoly. Most recently, the ruling in the antitrust case between Whole Foods-Wild Oats and the Federal Trade Comission went along those lines. The government argued that integration of the two retailers would increase prices and reduce the quality of their foods. The court eventually decided in favor of the defendants – the reasoning was that, locally, the presence of other stores guaranteed a reasonable level of competition. Some mergers have actually taken place in the recent past. Cinemark purchased Century Theaters in August of 2006; and AMC merged with Loews Cineplex in 2005. The latest move in the industry seems to be increasing the quality of the movie-going experience. As recently as December 7, AMC reached an agreement with Imax to buy 100 of its screens and digital equipment. Three other big chains –Regal, Cinemark and Carmike – are also investing in Imax technology, albeit at smaller scales. The idea, I can only imagine, is to charge a higher price for Imax shows. My prediction is that, not too long from now, theaters will become advertising venues. They will show only big budget films with lots of special effects -- the kind that's really worth seeing on a giant screen and generates lots of DVD sales. Theaters will have the Beowulfs, Spidermans and Pirates. And, of course, they’ll always have Paris… I mean… popcorn. While I agree with much of what you say, I believe you're wrong on a couple of points. In particular, you overstate the relative power of distributors vs. exhibitors by choosing an incorrect measure of market concentration. The number of sites is distorted by the large number of low screen, low revenue theaters which are more likely to be independent, but the largest exhibitors control a much larger part of the market than indicated by this measure. In particular, the three largest exhibitors (Regal, AMC, Cinemark) control ~38% of the screens (a better measure) and ~50% of box office (an even better measure of their bargaining power with distributors). These are better measures of market power than the number of sites. You wouldn't look at the market power of WalMart by counting up the number of stores it owns and comparing that against total stores of other retailers, but would look at sales or some other such measure, and the same needs to be true in ths case. On top of this, in many local markets one of these exhibitors will be dominant, giving them even greater power since the market for film exhibition is very much local. Of course, on the other side the 7 major studios (and their affiliated "indie" labels) are also very strong, more so than your measure looking only at the top 20 films implies, but there is still more balance to the market power between the major studios and major exhibitors than you suggest. Your conclusion from there that distributors have significant control over ticket prices is also overstated. That said, I agree exhibitors would benefit from attracting more customers by lowering ticket prices. More specifically, they would benefit from more flexible pricing - at current prices many shows do sell out (or near sell out) during the prime showtimes. Lowering prices across the board would thus have limited benefit. Lowering prices during off peak times (i.e. weeknights) when capacity is available to accomadate additional customers would however be beneficial. As for the idea of exhibitor consolidation as a solution, further consolidtation by the major exhibitors will be quite challenging. As mentioned above, the actual concentration is quite high among the top 3 exhibitors when measured appropriately, so a merger among those 3 (or even the top 5) would require substantial divestment to resolve local dominance issues. Any further consolidation is likely to involve one of the majors acquiring a smaller regional circuit in a region where that particular major exhibitor is currently weak (or possibly consolidation among regional players themselves). Thanks for your comment -- you made a valuable and welcome contribution to my post. Much of what you say seems to be based on better knowledge of the data, so I don't have much to say about that. But I'll try to write a reply to some of your points (later this weekend, when I find some time). What would be the opposite side of the coin: if one or more exhibitors become dominant as a result of one or more mergers?